GRAPELAND – Lions Club District 2X-3 District Governor (DG) Joe Holman stopped by the Grapeland Noon Lions Club on Thursday, Aug. 17 to discuss his vision for the region and pass along a message from Lions Club International President Naresh Aggarwal. Following the meeting formalities, Grapeland Noon Lions Club President Mike Goolsby introduced the district governor to the Grapeland club members. Holman thanked the club for their warm reception and provided a brief sketch of his background and military service. Once he concluded his introductory remarks, Holman expressed his appreciation for being selected as the 2X-3 District Governor. “I am blessed and honored to be your District Governor this year. I emphasize the fact that I am your governor. I am here to serve you. You are not here to serve me,” he said. As he continued, Holman discussed the catchphrase of Lions Club International President Naresh Aggarwal. After he extolled the positive activities of the Grapeland Lions, Holman moved on to discuss the theme of the Lions in the upcoming future. 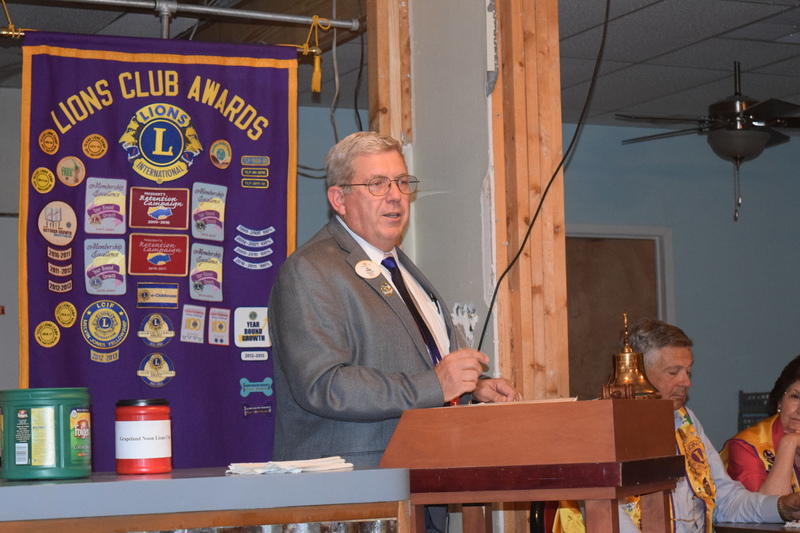 Holman moved on to his next topic and said the Lions Clubs in Texas would soon celebrate the organization’s 100th anniversary in Dallas and would have a special guest speaker at one of the many events and activities planned for the centennial celebration. The district governor said guest speaker would be next year’s Lions Club International President would be Gudrun Bjort Yngvadottir from Iceland, the first female president of the international organization. “The community needs something. There is something out there that Grapeland needs. Find out what it is. This is a vibrant, active club. You are doing your things, your way. I was looking at stuff y’all do from scholarships to SPOT vision to trash pick-up, y’all do so much for this community – it’s unbelievable. I am proud to be your district governor and I’m going to use you – with or without your permission – as an example for some of the others clubs in this district,” he said.